Stut was my submission for the second qualifying round of the Last Photographer Standing competition. The themes for this round were Stately or Humble up to that point none of my ideas had panned out. With about 30 hours left before the deadline I had given up on entering the round when I saw the turkey. He was strutting his stuff around the yard and he sure seemed to think of himself as stately. It tickled my funny bone so I started shooting. Now, there was nothing fancy about the setup here. 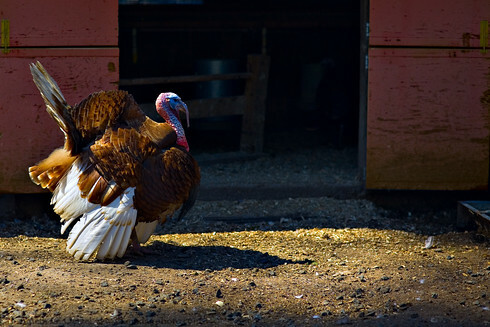 Just my camera, a turkey in a pen, and spotty afternoon sun. However, the shooting conditions were atrocious: the direct sun was harsh, the lighting contrast as much as 6 stops in places and I was forced to shoot over a wire fence which significantly limited the available camera angles. The (I believe now incorrect) approach I took at the time was to follow the turkey with the lens as he strutted around pen, continually adjusting the camera for the changing light conditions. Getting the camera set for an accurate exposure was difficult in the high contrast light and several times I missed a good shot while I was fiddling with the camera. The net result was I captured 60+ bad pictures of a turkey and one good one; and the good one was my last shot because I knew I had what I wanted. So then, what is the lesson learned? Realistically, there was only one good place in the pen to shoot the turkey. Right in front of that door was right for many reasons. Among other things, it was as far away as the turkey could get giving be the best possible camera angle and the direct sun with the shaded background provided the best isolation of my subject from his background. Rather than spending a lot of taking shots that had no chance of being good, I should have set the camera up for my chosen location and waited for the turkey to arrive. That would easily have saved me half an hour of shooting, half a gig of card space and given me a better shot when I was done. In a nutshell, even in a situation where you have no control over the players the right answer is often imagine the shot you want, plan for it and wait for it to happen. Shooting in an unplanned way can mean you are not ready when that perfect moment hits so you either miss it or screw it up. Note: Strut did not make the top 10 in that competition which was no surprise to me. It tickled my funny bone to enter a turkey when "stately" was the theme, but I know I have something of a warped sense of humor.